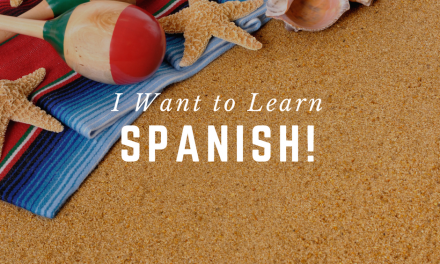 This list of the benefits of learning Spanish is for me, to remind me why I’m learning Spanish in the first place… at “MY AGE”! See, I’ve got a little trip planned to Mexico next year, and I want to get fluent enough to hold a little conversation, find my way around, and feel more comfortable out of my element. There are lots of reasons to stretch our brains and learn a new language. So, I made this list to keep me going – because even though it’s fun to learn something new, it’s also not something I’m likely to stick to unless there’s a good reason. One good reason might be enough, but here are 10 – oh, plus I promised myself a fish bowl-sized margarita if I reach my goal. On The Fence About Beginning to Study Another Language? Learning another language requires a lot of time, energy, and patience. Investing these requirements into learning Spanish has many benefits beyond simply being able to speak another language. If you are unsure if you’re going to want to dedicate your time to learning Spanish, take a look at these ten reasons. Pursuing more knowledge keeps your mind young and active. It is a reward in and of itself. Learning Spanish, whether you end up using it or not, will make you feel smarter and wiser for being bilingual. Beyond just the language, we associate Spanish with rich, beautiful cultures and heritages amongst the Spanish-speaking population of the world. With so many various dialects, whether you’d want to learn Spain Spanish, Colombian Spanish, Mexican Spanish or beyond, you can learn a lot apart from the language alone. With the help of the internet, the world is a smaller, compact place where you can communicate with people all over the world. A lot of people learn Spanish to communicate well with their friends that speak Spanish. A huge percentage of the world speaks Spanish, and the amount of people who speak both Spanish and English is rising. Spanish is one of many beautiful and romantic languages throughout the world, causing many people to seek out learning it. The manufacturing field is full of contenders that are Spanish speaking countries. If you are working in the field, gaining a level of Spanish fluency over the next few years will give you a strong competitive edge. The global economy is becoming increasingly more connected, making secondary language learning a major key. As Spanish is actually the 2nd most frequently spoken language used throughout the world behind English, it is a good investment. By learning another language, you are setting a good example for your children to seek out knowledge and learning new languages. When helping people who are in need, being able to communicate with them by speaking their language is very helpful. Throughout the world, there’s a lot of Spanish-speaking individuals who need assistance in less-fortunate situations. It’s good to be able to understand what needs are most prime. This can be done by learning their language. You could learn Spanish by attending classes, using the internet, or using books. Regardless, there’s something really cool about knowing Spanish. Learning another language is a huge achievement, whether it be Spanish or otherwise. The most effective Spanish-learning method is diving into a fully immersive language program. These can be offered in many ways, including on the internet. Getting started is the first and most important step for getting all the benefits of learning Spanish. PreviousI Want to Learn Spanish!